The day has come for Ayumi’s big move to city life in Saitama. More than her friend, not quite her sweetheart, Hashio sees her off with his true feelings buried deep in his heart. As the truck pulls off, the heartache written on Ayumi’s face summons back the memories of that day, the words he couldn’t say. Alone on the dusty country road, Hashio slips into quiet melancholy. Before he knows what he’s doing, he finds himself running full-tilt after her! This game uses keyboard control. On the title screen, click the Start Button to start the game. After a short cutscene, the game will begin. You can adjust the difficulty before you start the game. You can adjust the difficulty settings before you start. There are five selectable difficulty levels, with “5” being the hardest. If you enter a Username on the title screen, you can participate in the high score rankings. You can check the current high score rankings by clicking the Show Rankings button. As the game starts, you will see Ayumi drive off before gameplay begins. Jump over the bouncing luggage and other obstacles. Colliding with them will result in damage and may even send you tumbling. Hashio runs at the same speed as the truck, so over time he will lose endurance little by little. If he gets knocked off the screen, he’ll do a super-sprint to catch up, which expends a great deal of endurance. When Hashio’s endurance runs out, the game is over. Once in a while, endurance-boost items will be thrown from the truck or by farmers working by the side of the road. Catch these to get your energy back and keep running until Ayumi notices you. 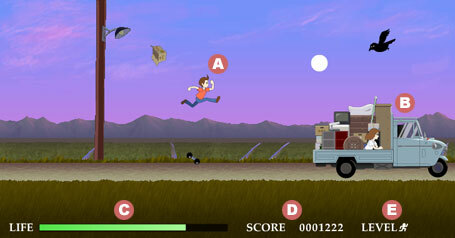 The closer you are to the truck, the higher scores you will get for running and for jumping over obstacles. As you can see, the luggage is completely unsecured and will fly off at the slightest provocation. Each item has a different bounce pattern and damage penalty, so take care. Pops out of the ground when you least expect it. If Hashio trips over it, he’ll stumble and fall. A mean old critter who harasses you by skimming close to the ground or unloading its droppings at just the wrong moment. The most enthusiastic sportsman in the village. When the day’s farm work is done, he can always be found racing around the village on his bicycle. Seeing you running pell-mell after Ayumi inspires him to toss you power-ups like lemons or the local specialty, corn. The statue of Jizo, the guardian deity of travelers and children, stands watch over the village. He receives many rice dumplings as offerings, and he just might share them with one who has the courage to follow his heart.